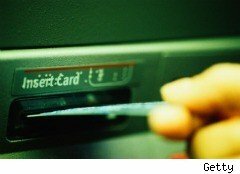 ATM fees have become even more of a budget buster in the last year, especially in cities like Seattle, Denver, Houston and Miami where fees ATM owners charge non customers are, on average, 30 cents or more higher than in other parts of the country, a recent Bankrate study found. Bankrate's 2010 Checking Study found the highest ATM fees in Seattle, where the average fee is $2.69, 36 cents higher than the national average of $2.33. Since we're talking averages, that means some folks in Seattle are actually paying as much as $4 a pop when they visit an ATM that isn't part of their bank's network.Close behind Seattle for highest ATM fees are runner-ups Denver ($2.65), Houston ($2.63), Miami ($2.56) and the New York Metro area ($2.55). The city with the lowest fee? Cleveland ($1.83). Greg McBride, a senior financial analyst at Bankrate, explained that the average that Bankrate found for each of the cities is a reflection of only the five largest banks and five largest thrifts and does not reflect every institution in the metro area. Cleveland obviously has fewer banks that charge steep fees, and so they wound up with a better average. Other cities where fees are lowest: Minneapolis ($1.95), Kansas City, Missouri ($2.00), Milwaukee ($2.08) and Pittsburgh ($2.10). But folks in Cleveland and Milwaukee are still paying more. In fact, we all are. Over the past decade, ATM goers are paying an average of 11 cents more per transaction, Bankrate found. The nationwide average for ATM fees, $2.33, is 5% higher than it was last year. What's really sick, though, is that the actual cost of a typical ATM transaction is 36 cents! If you're going to an ATM that isn't part of your bank's network, you're getting supremely ripped off. "By exercising a little bit of caution, consumers can save themselves a lot of money and grief. A consumer who goes to an out-of-network ATM weekly can save $260 per year usually their bank's ATM instead," says McBride in the company's press release. Geoff Williams is a frequent contributor to WalletPop. He is also the co-author of the book Living Well with Bad Credit.